A new composite image of Chandra and Spitzer data shows G54.1+0.3, the dusty remains of a collapsed star. 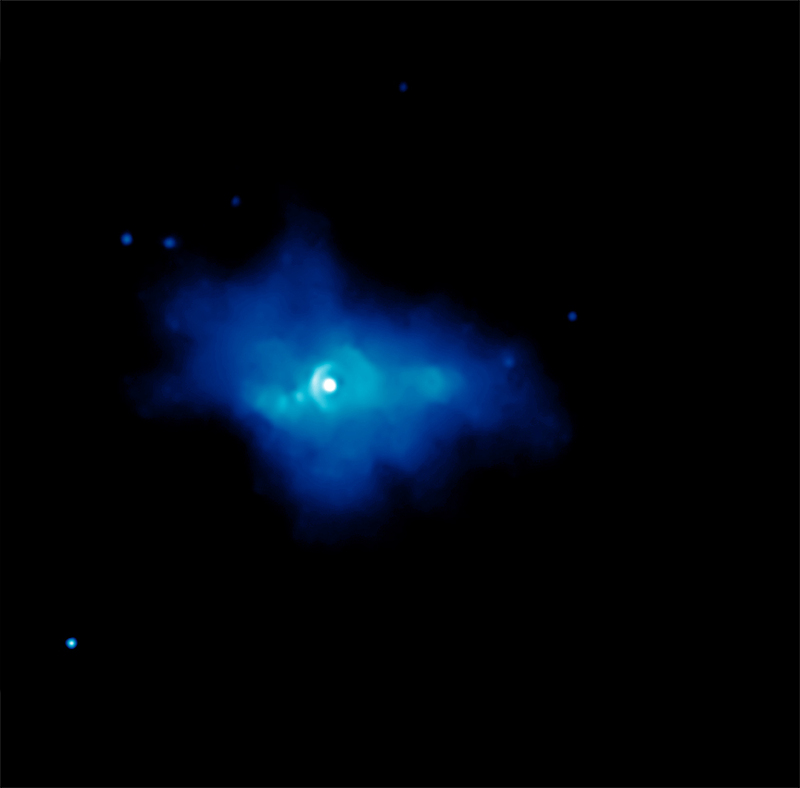 X-rays from Chandra reveal a wind of high-energy particles from the pulsar at the center of the image. The Spitzer data shows an infrared shell around the pulsar that is made of gas and dust that condensed from the supernova. A new image from NASA's Chandra X-ray Observatory and Spitzer Space Telescope shows the dusty remains of a collapsed star. The dust is flying past and engulfing a nearby family of stars. Scientists think the stars in the image are part of a stellar cluster in which the a supernova exploded. The material ejected in the explosion is now blowing past these stars at high velocities. 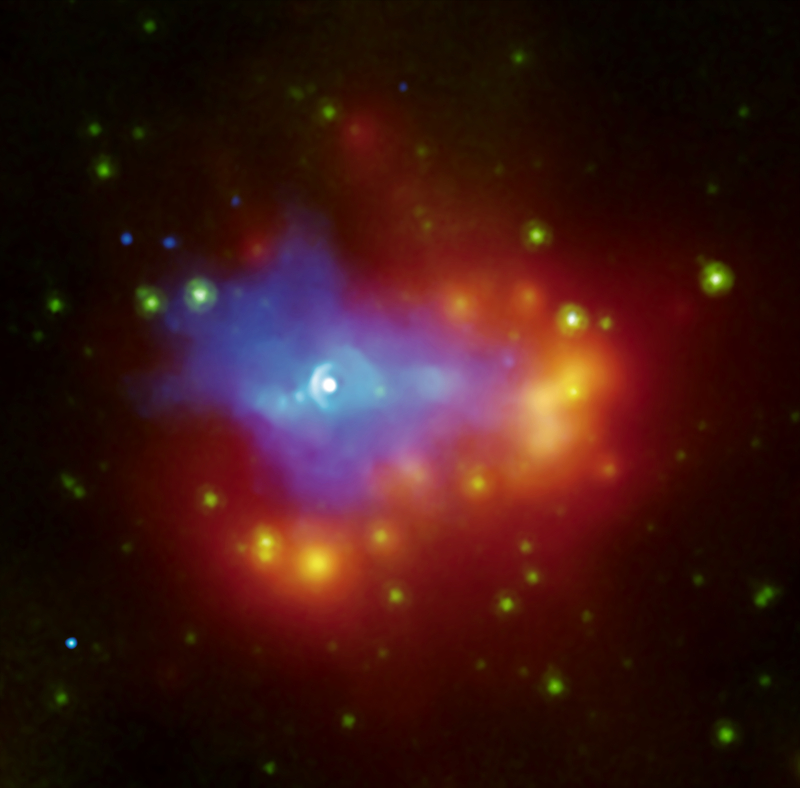 The composite image of G54.1+0.3 shows X-rays from Chandra in blue, and data from Spitzer in green (shorter wavelength infrared) and red-yellow (longer wavelength infrared). The white source near the center of the image is a dense, rapidly rotating neutron star, or "pulsar," left behind after a core-collapse supernova explosion. The pulsar generates a wind of high-energy particles -- seen in the Chandra data -- that expands into the surrounding environment, illuminating the material ejected in the supernova explosion. The infrared shell that surrounds the pulsar wind is made up of gas and dust that condensed out of debris from the supernova. As the cold dust expands into the surroundings, it is heated and lit up by the stars in the cluster so that it is observable in the infrared. The dust closest to the stars is the hottest and is seen to glow in yellow in the image. Some of the dust is also being heated by the expanding pulsar wind as it overtakes the material in the shell. The unique environment into which this supernova exploded makes it possible for astronomers to observe the condensed dust from the supernova that is usually too cold to emit in the infrared. Without the presence of the stellar cluster, it would not be possible to observe this dust until it becomes energized and heated by a shock wave from the supernova. However, the very action of such shock heating would destroy many of the smaller dust particles. In G54.1+0.3, astronomers are observing pristine dust before any such destruction. Scale Image is 3 arcmin across (about 17 light years across). This is breathtaking. This should be made available to students in elementary school. Amazing how mankind can go that far with their instruments hope someday we can go in person. Is it possible that black hole creation is almost at a halt? Since most of the first generation gargantuan stars are now black holes, this leaves pulsars and heavy amounts of stellar debris without orientation. Which might create gigantic heavy dust fields that might in turn create gargantuan stars again repeating the cycle. Thanks, awesome work. How beautiful is the universe we live in. I have the greatest admiration for such explorers like you. The dusty remains of a collapsed star. About 20,000 light years from Earth. X-rays from Chandra were overlaid on infrared data from Spitzer. About 17 light years across. X-rays are blue, shorter wavelength infrared are green and longer wavelength infrared are red-yellow. In the constellation Sagitta (the "arrow") visible in the Northern Hemisphere.